Now of course, I need to replace the whole trans cooler. I mean to replace the sawed-off metal tubing with rubber tubing. 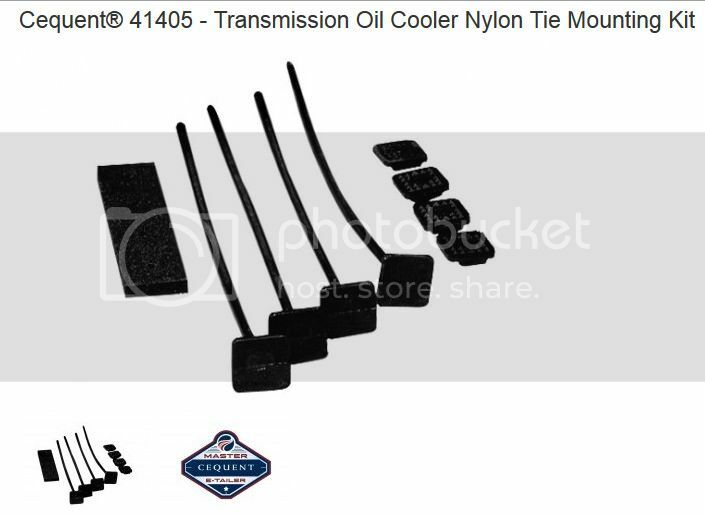 Now, I've never removed a transmission oil cooler before and am stuck on how to do it. Will I have to remove the fan assembly and radiator just to get to whatever holds the trans cooler in place? That is an aftermarket cooler. They use plastic holders that pass right through the radiator to hold them attached.They are one time use and will have to be cut to remove the cooler. The new cooler should come with some new ones to attach it. This means that the plastic holders pass through the water cooler and then also through the air conditioning radiator? In essence, I would need to remove the fan assembly in order to reach where these holders end up? You'll have to peek behind the condenser to see if they go all the way through. They could have ended them at the back of the condenser. You can also if it's easier. You can also if it's easier. I looked through the condenser fans to see if I could find where the holders come out, but I couldn't see to much as the blades and plastic fan housing is quite large. Maybe the holders only go through the water cooler and not the condenser? I'll have to investigate further. This morning I went to the store and bought another cooler that comes with a mounting kit. I'll see about it today after work.